On Sunday, February 3, 2019 the FILS (Future Iota Leaders) and members of Nu Chapter of Iota Phi Lambda Sorority, Inc. took a black history tour. This tour was part of the Sorority’s Black History Month celebration. Dr. Jamal Tourè owner of Day Clean Journeys and Political Science Professor at Savannah State University guided the tour. The tour included stops at the First African Baptist Church, Franklin Square, Factors Walk and the Hermitage Plantation (Yamacraw Village). 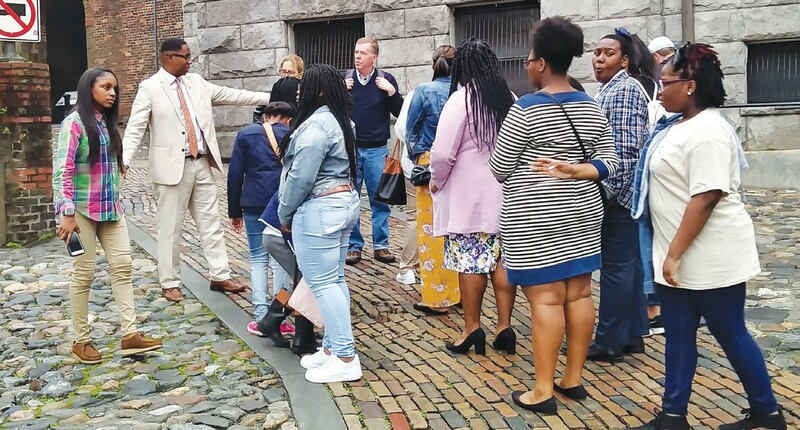 The youth and adults learned that the real direction of the first Underground Railroad went south from Charleston, South Carolina to St. Augustine Florida. A wealth of knowledge was shared during the tour. The highlight was learning that Dr. Tourè is a model in the Haitian Monument located in Franklin Square. This event was opened to the public. Sorors attending the tour with the FILs were Cynthia Stephens (President), Ursula Jackson Green (Dean of Intake), Lisa Barnes (Journalist) and Sheila McGirt.